Radio Tower Ascent #1 I passed an online climbing certification course and borrowed a harness from a cell tower rigger. At 7:30 am, on Tuesday, February 4, 2014, it was minus 11 degrees Celsius without the windchill. 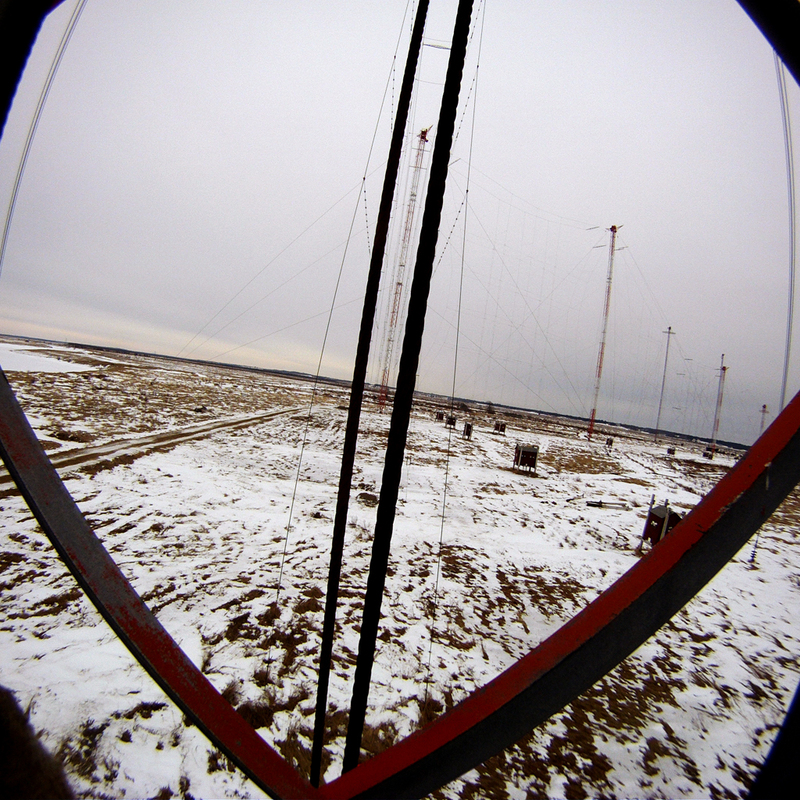 With only two hours sleep and no breakfast, I climbed 120 feet up tower M on the RCI transmission site in Sackville. Tower M was over 430 feet tall. I didn’t even make it halfway up. But the view was incredible. The silence surprised me most. The sounds of the highway and heavy machinery below disappeared. I heard only my breath, the wind, the scraping of my harness sliding up the safety rail, and the peeling of my gloves off the frosty metal rungs. These images were taken by a gopro camera that I wore as I climbed. In April, I climbed 250 feet to the top of tower C, the last tower standing. 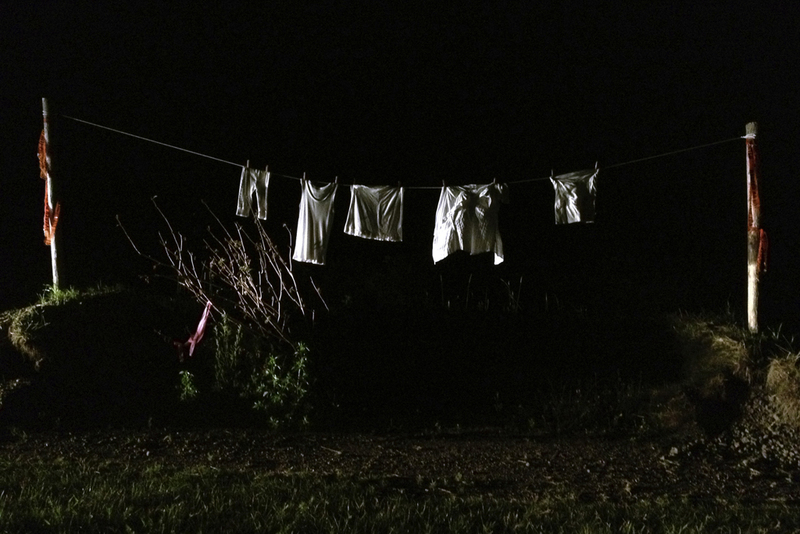 Industrial Domestic is a body of work exploring intersections between the domestic, the rural, and the industrial. 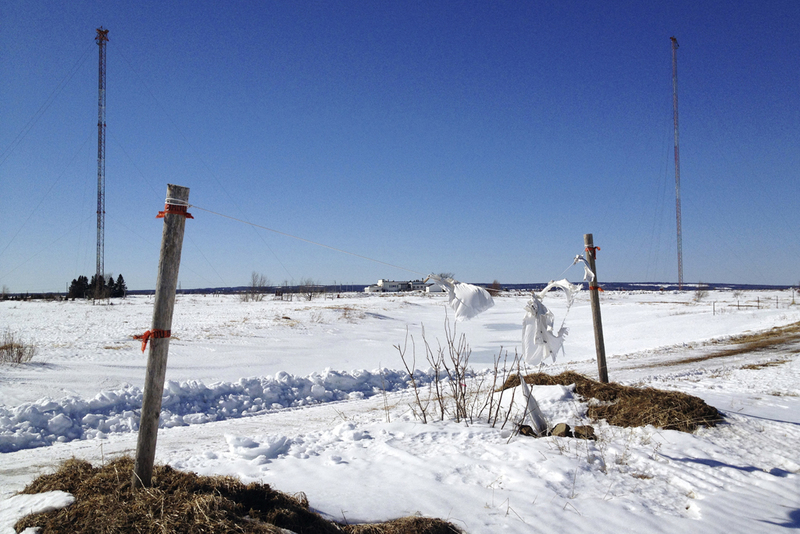 Laundry Line Antennae references the documented events in Sackville when people’s clotheslines acted as antenna and picked up radio broadcasts from the RCI shortwave radio towers on the Tantramar Marshes. Most documented stories about this phenomena relate to the Anderson farm which was a dairy farm located very close to the RCI site. 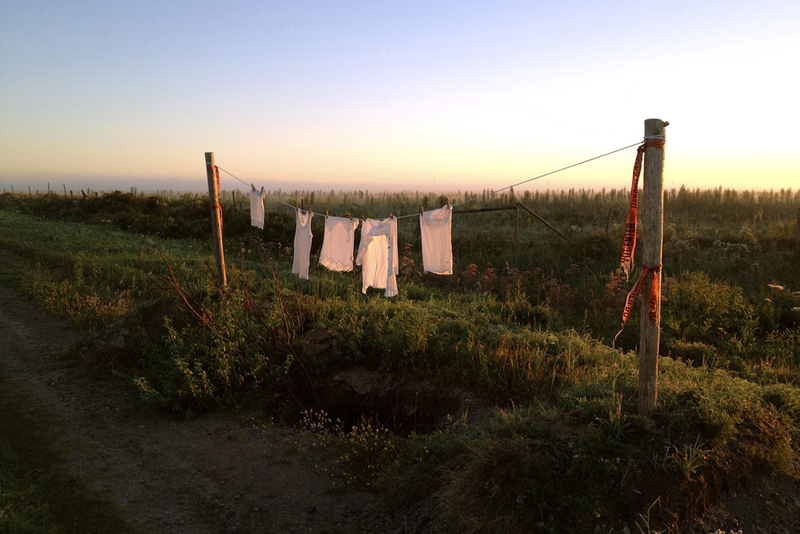 In the 1960s the farm was bought by the CBC because it was too close to the site, and the woman of the house was getting dangerous electrical shocks from her clothesline whenever she hung out the wash. 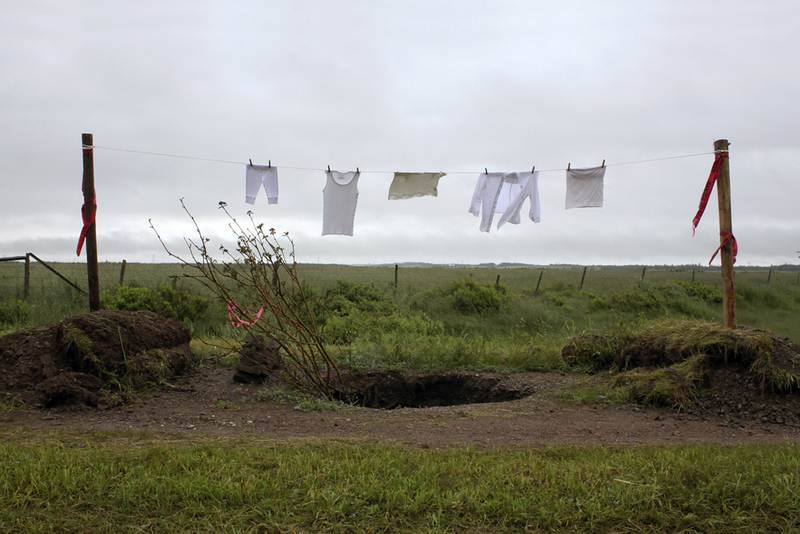 The clothes line in this photo series was installed over a sink hole on a seldom used public access road behind the site, and documented over the course of a year from 2013-2014 as the site was gradually dismantled. 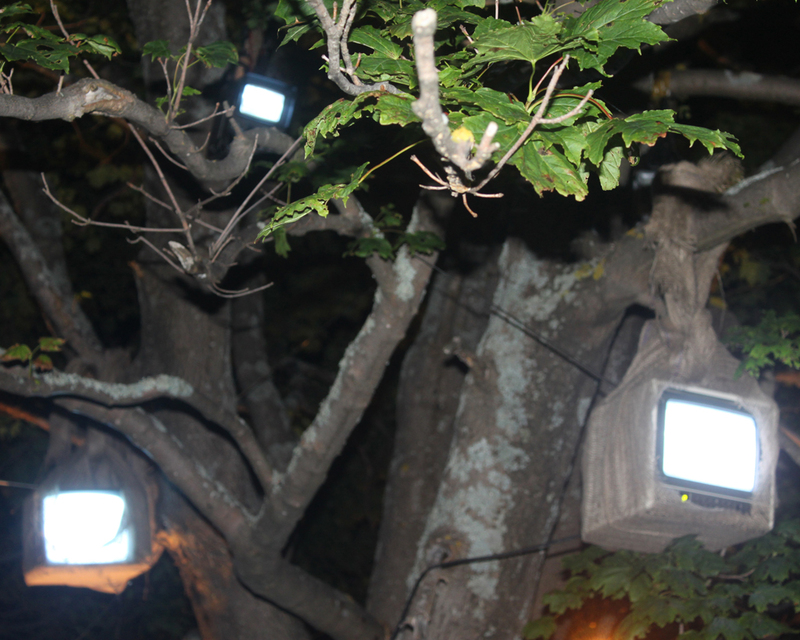 Last Days of Snow explores the death of analogue television transmissions. Since 2011, most over the air analogue transmissions have been phased out, and replaced with digital signals. For those without a digital conversion box, their old TVs with antennae no longer receive signals, which results in a loss of access to information for many low income residents of remote areas. 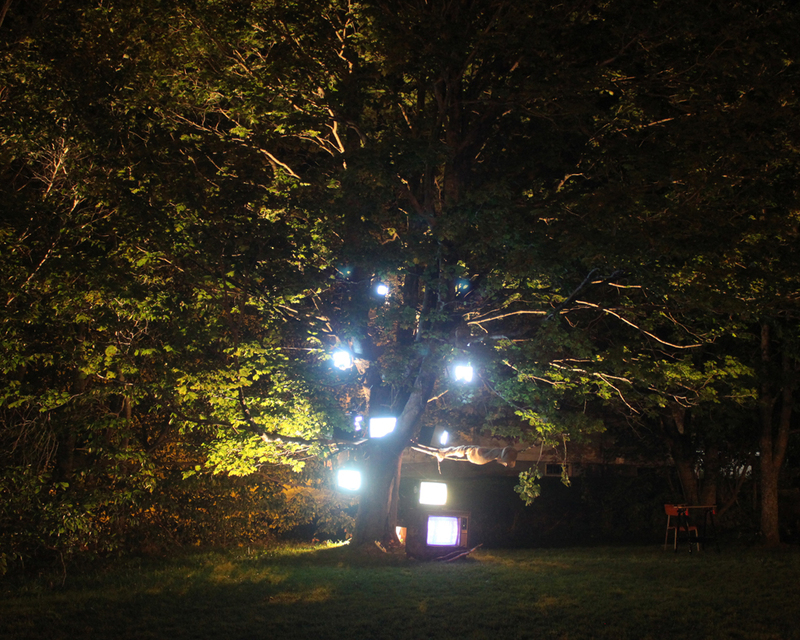 Nightlights Like Fireflies is one of four related works in this series. 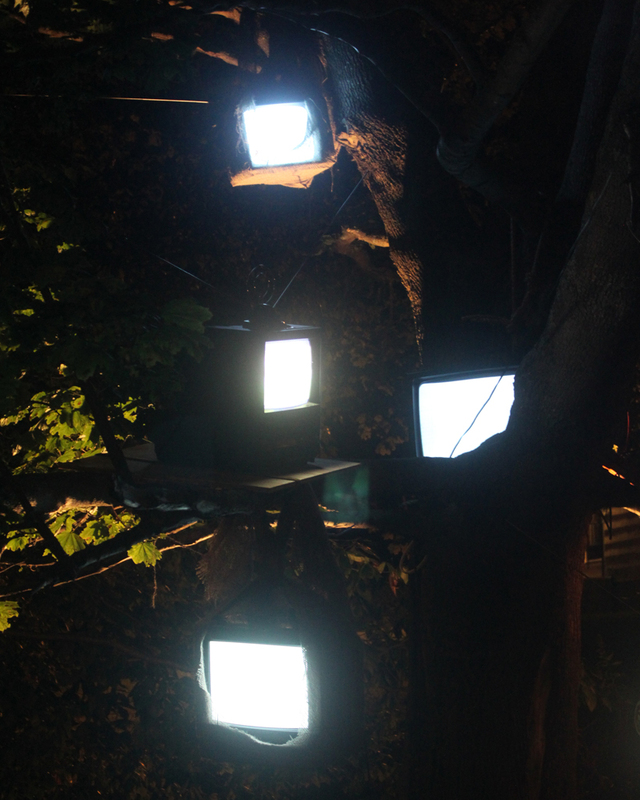 12 televisions, tuned to various stations, were hung in a tree on August 27, 2011, 3 days before the end of most transmissions. 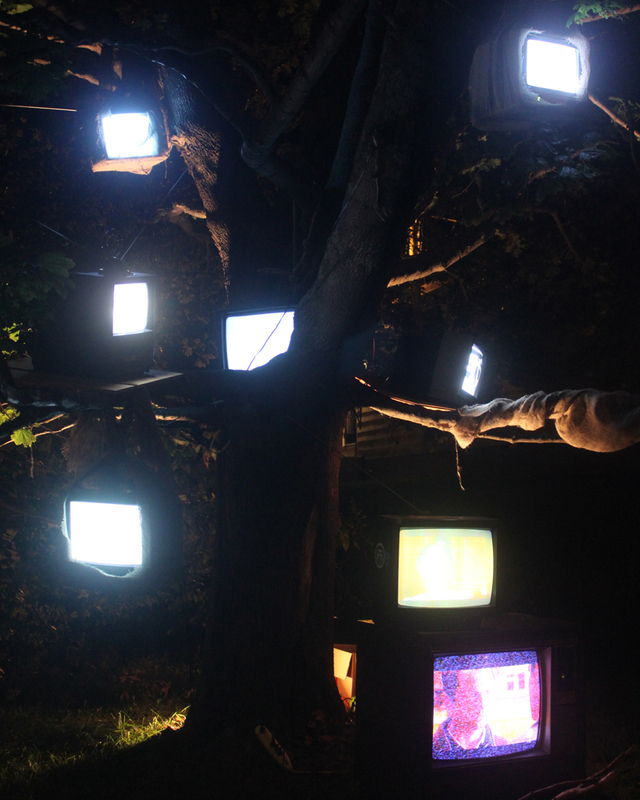 It is a reflection on discarded technology as CRTs began to fill landfills. 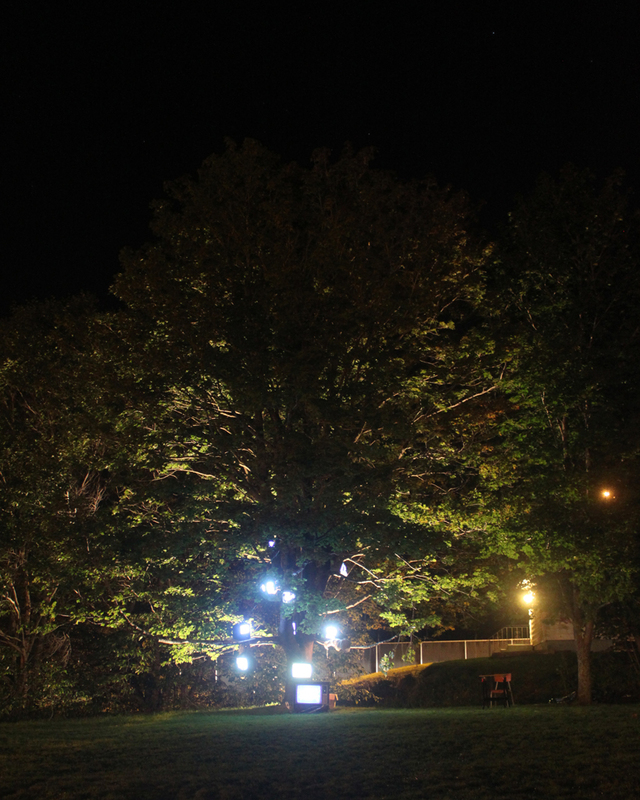 The CRT was rendered lifeless and dark on curbsides; a nightlight now more night than light. If only these abandoned tubes could flirt in open fields and lift themselves up to perch in the trees flickering blue nightlights like fireflies. Amanda Dawn Christie works in film, performance, photography, and electro-acoustics. She has exhibited and performed in galleries across Canada, and her films have screened internationally from Cannes to Korea to San Fransisco and beyond. She completed her MFA at the SFU School for the Contemporary Arts in Vancouver, before moving to Amsterdam. After returning to Canada she worked at the Faucet Media Arts Centre and later as director of the Galerie Sans Nom and the RE:FLUX festival. Concepts and themes explored in her work focus primarily on the relationship between the human body and analogue technology in a digital age. IOTA/MB: Your works focus primarily on the relationship between the human body and technology, in particular the relationship between the human body and the analogue to the digital. Can you elaborate on the notion of nostalgia the body in your work as it relates to dying abandoned technologyies? 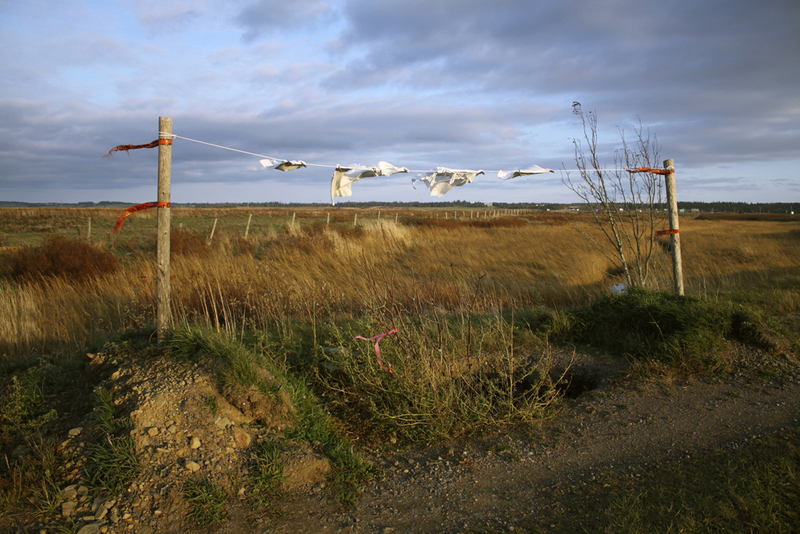 ADC: Recently, I’ve begun to see these technologies as abandoned or orphaned rather than dying. Technologies such as celluloid film, over-the-air (OTA) television, shortwave radio, and basic electronics, still work as well today as they did when they were first invented. As such, these technologies are not dying at all, but rather they are being abandoned by the commercial industry and consequently by consumer culture. They are becoming orphan technologies. One of the beautiful things about these orphan technologies, is the direct (read analogous) link with the human body – one to one relationships where if I move this thing with my finger, that happens; if I stand here, this happens. Bones, joints, and ligaments of the human body are not that different from many mechanical principles. The human body is also an electrical machine, and energy is continually flowing into and out of our bodies in many forms. Meanwhile radio waves (which include shortwave radio, AM, FM, television, cell phone signals, Bluetooth, and WiFi) are flowing around and through our bodies on a continual basis. It only feels natural then to look at the intersections of these orphan technologies with our bodies and to look at what is becoming of them now. IOTA/MB: You’ve worked in film, video, audio, performance, dance, and photography; how do you know what part of your practice to bring out for a response to your subject matter. ADC: My choice of material or treatment of a subject usually evolves organically. I will often start an exploration in one media or discipline, and then as my research deepens, I will be drawn to pursue parallel explorations in another media, and then another and another. I will often spend years exploring the same subject through various methods and approaches. This is why many of my projects have one single master title, and then a sub-title relating to that specific experiment or approach. Sometimes my use of a particular media or discipline is invisible in the end process. For example, I often work through ideas with my body (in the dance studio, outdoors, or even next to my computer or work bench). These physical explorations later manifest in my writing, film editing, and sound work, even though there is no evidence of that process in the final work. Each discipline feeds and informs the others. IOTA/MB: The language surrounding, critiquing or revelling in cinema often uses the word poetry either to describe a filmic ambience, or to speak to the visual choreography of a film, which can also be described within the scope of poetry. Poetry, as it relates to film, doesn’t seem to be a response to written poetry, but to metaphorical poetry. As an avid reader yourself, and knowing that some of your influences are the films and writing of Maya Deren, the writing of Umberto Eco, T.S. Eliott, and James Joyce, can you respond to the relationship of literature and poetry, and your film and performance work? 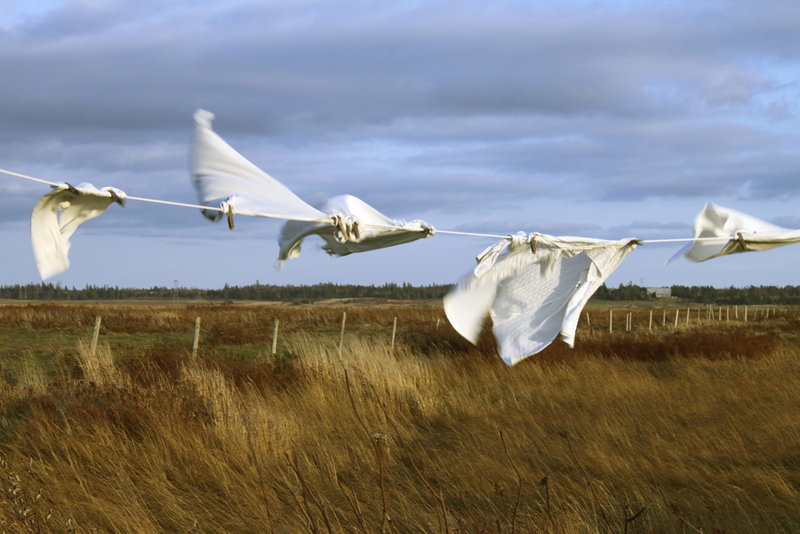 ADC: I approach film and physical performance in the same way I would apply language to poetry. I use the vocabulary of film (image, audio, editing, rhythm etc), in a more poetic approach rather than in a direct narrative approach. Performance, like film, also has a coded linguistic structure of movement vocabulary, phrasing, and rhythm. Both my performative and filmic works are structured closer to poetry than to narrative, in their use of metaphor, imagery, repetition, allusion, and form. IOTA/MB: What are the challenges of having your work exist in an interdisciplinary context? ADC: One of the greatest challenges is keeping my tools sharp; and by tools, I mean my own body and my skills. I would love to dedicate 4-6 hours each day to every one of my disciplines, but instead I often work in spurts with periods of time (weeks or months) with more emphasis on one skill than the others, depending on the project I am working on. As a result, sometimes I feel like some parts of my practice suffer at the expense of others, but then the emphasis shifts and flips. In the past I would focus on one discipline at a time, intensely for months or even years, then I would switch to another. Right now, I’m trying to change my practice so that I can dedicate a bit of time every day to each aspect of my practice to keep all of my tools and skills sharp, and especially the tools of the body, voice, and mind. IOTA/MB: What experiences, outside of art education, have influenced the ways in which you work with your materials? ADC: Access to materials and equipment has often played a large role in the way I work with materials. I made more hand processed films when I had readily available film stock, chemistry, and darkroom spaces. Short ends of film stock are becoming harder to come by, so now I am working more with electronics, and returning to work with my body. Much of my work is also influenced by the technology, architecture, and landscapes of my environment. I draw a lot of inspiration from the spaces around me, and these spaces often then have a direct impact and influence on my projects. 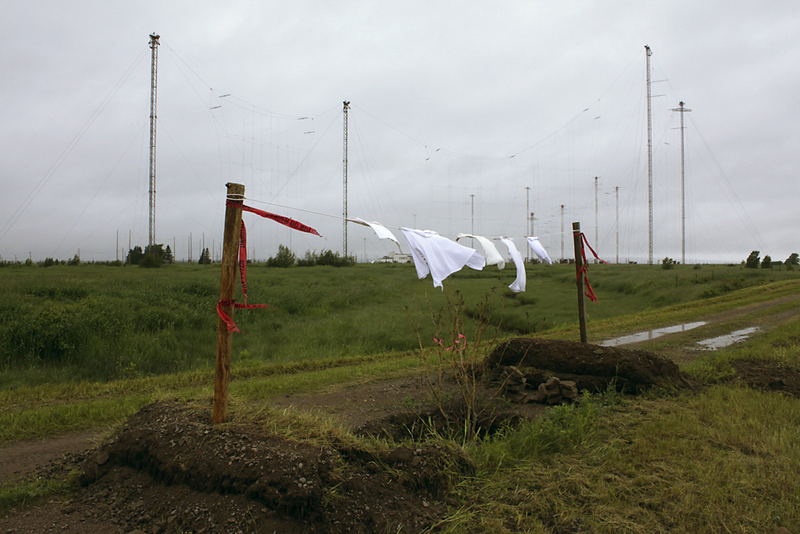 ADC: The “Laundry Line Antennae” photos will be included in a show called “Phantom Presence: Contemporary New Brunswick Photography” at the Beaverbrook Art Gallery this summer, and my installation “Radio Towers Like Windchimes” will be included in the McCain Biennale of Atlantic Contemporary Art this fall, also at the Beaverbrook. 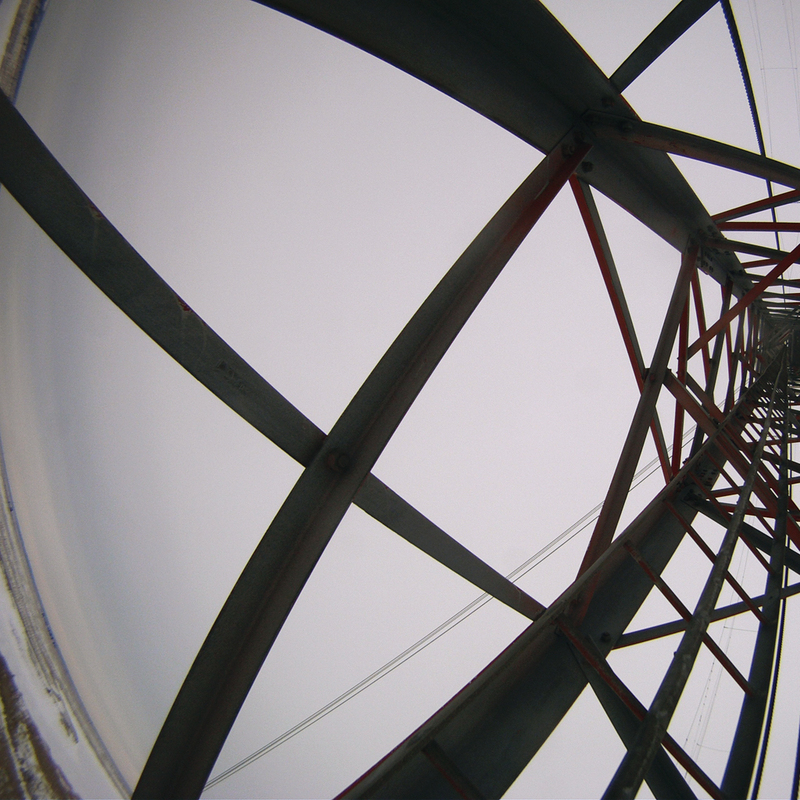 I am currently in the final stages of post-production on Spectres of Shortwave, my feature length documentary film about the RCI shortwave radio towers that were located in Sackville. 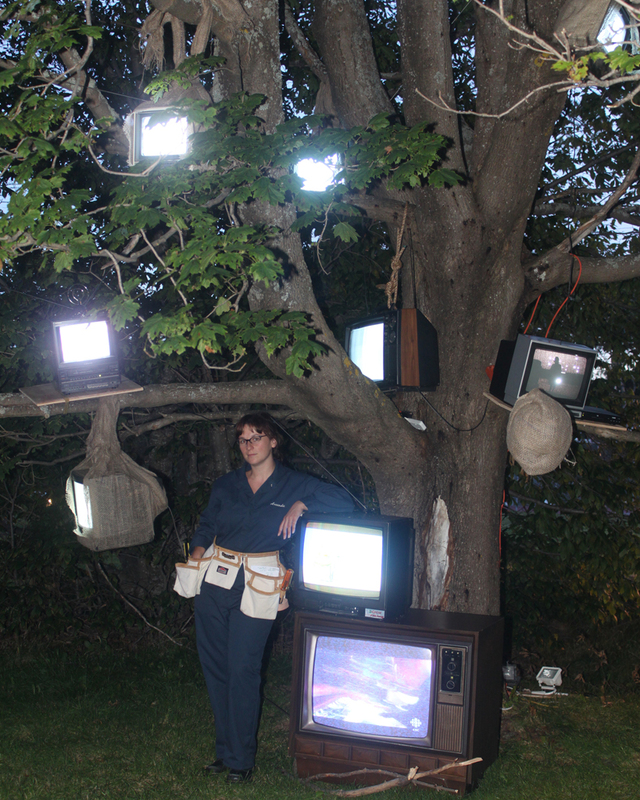 Thanks to the support of a Canada Council New Media Creation Grant, I am now working on a project called Requiem for Radio, which is a suite of five distinct works that seek to honour, question, and engage with the traces and the memory of the RCI of shortwave transmission site in Sackville. This rather ambitious project involves buiding 13 theremins, that I will run through a Max MSP patch to trigger audio recordings that I made by placing home made contact microphones onto the shortwave radio towers before they were torn down last year. There were 13 radio towers on that site, and I recorded the sounds of each one of them, so I am building 13 theremins, 1 for each of the towers, and I will set them up as a scale model, with their distances from one another, and antenna heights relative to the towers they represent. 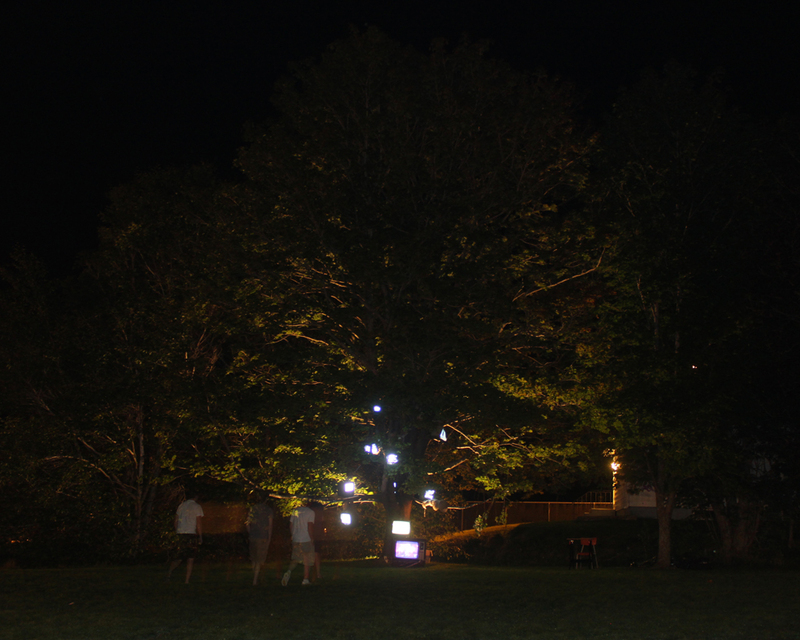 The finished project will have two incarnations: 1. as an art gallery installation where the public can enter and play the ghosts of the radio towers with radio waves, and 2. as a dance performance where the theremin / towers are played by dancers. The Requiem for Radio suite also includes a solo performance for 1 theremin, as well as a musical instrument that I am building out of cowhide, cow bone, electronics, and an AM radio transmitter, that will transmit into my radio sink (a radio receiver built with copper plumbing instead of wire). I will be doing some of the theremin and programming work for Requiem for Radio while on a residency in New York this fall at the Wave Farm, and then continuing down the East Coast of the US on a little film tour with screenings in Brooklyn, Syracuse, and Harrisburg.